If you’ve never played The Longest Journey or Dreamfall, you could be forgiven for thinking that Dreamfall Chapters is set in a world of rolling hills, sunbeams and magic. That’s partly true. There’s another world behind and sort of alongside that one. Stark is one possible future of our world, and it contrasts sharply with Arcadia’s green and pleasant lands. 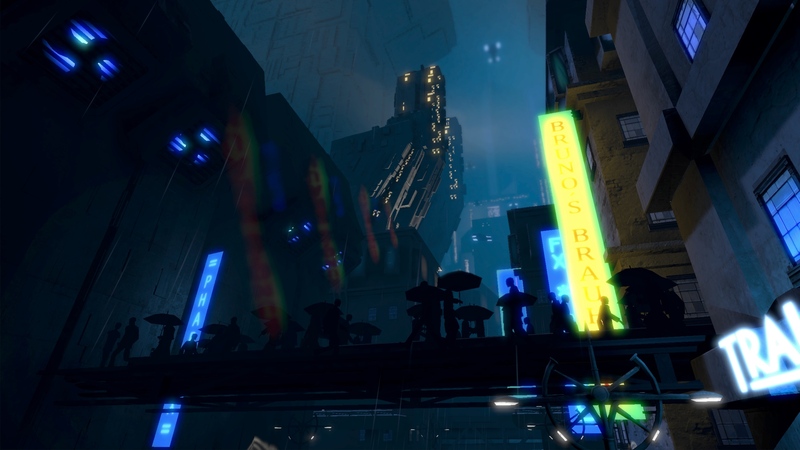 The latest Kickstarter update contains the first sight of Europolis, a cyberpunk dystopia of dark alleys, and neon-bright corporations and nightclubs. Below, you’ll find the latest video, showing the city streets and providing an insight into the state of Europe in 2220. All of the footage is in-game, taken from the current prototype. I’ve also included some screenshots and concept art, including two new characters, that you can’t find anywhere else just yet. For good measure, I asked project director Ragnar Tørnquist to provide some detail about the characters and the city. You can click any images, including the concept art at the top of the post, to make them magically grow. This is, as far as I can recall, the first mention of adventuring hubs and their inclusion makes the hybrid control scheme more fitting than I’d thought previously. Given time and freedom to explore an environment, without the gentle hand of ‘NEXT PUZZLE’ at one’s back, it makes sense to have a means of moving through the world in less abstract fashion. Mira — an Indian woman in her mid-20s — runs an underground network that extends from Newport in the west to Mumbai in the east, with Europolis as its brains and central nervous system. Mira hails from the tech-slums of Mumbai; born on the streets, she survived the cyborg gangs, the street-assassins hired by local police, and corporate Jägers hunting for live subjects for the burgeoning genetic research industries. 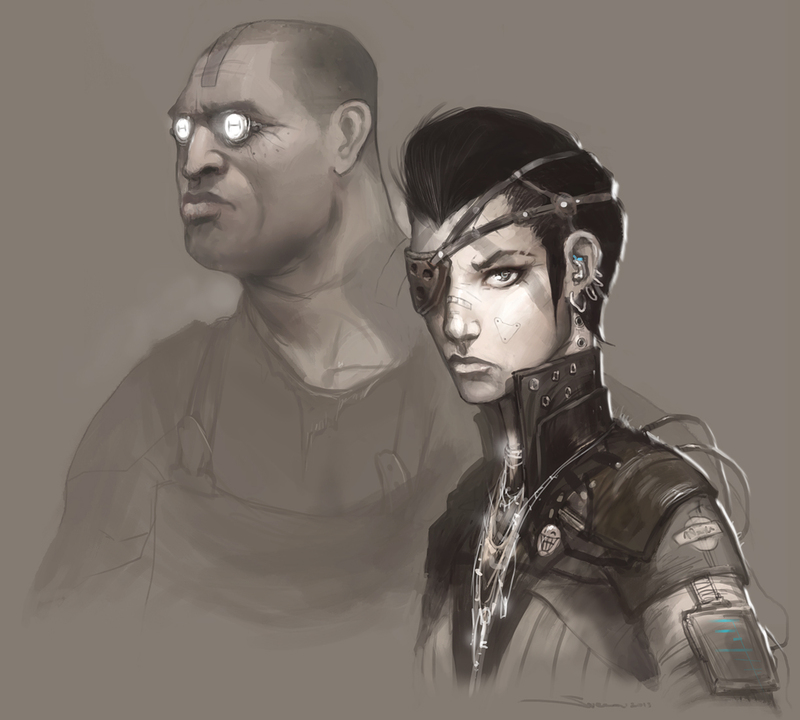 Sharp as a knife and a gifted gabber, Mira has built a subterranean empire that encompasses such renowned hackers and dealers as Burns Flipper in Newport, and Olivia in Casablanca. She’s notorious, wanted in fifteen city-states, and at any time every major corporation has at least one contract out on her with the world’s top hit men — but she gets by. Wit, Mira’s partner, may look like the muscle, but he wouldn’t hurt a fly. It’s actually the other way around: Mira has always protected Wit and treats him like a younger brother. Wit is a silent genius. He can build anything from scavenged parts and rogue code. He’s incredibly nimble, patient and focused. He may be unable to communicate with anyone, aside from Mira, but he makes up for his deficiencies by being the absolute best at what he does. RPS: Oh no! Europe is where take most of my holidays. What happened to it? Tørnquist: You know, I can recommend southeast Asia. It’s lovely, warm, friendly and cheap. Why settle for an industrial, crime ridden urban wasteland when you can have pristine beaches and coconuts? In our version of 2220, Europe is finally paying the price for hundreds of years of imperialism, reactionary politics, wasteful spending and industrialisation. Europolis is the dark and rotten heart of this new Europe. The giant megalopolis stretches from former Poland in the east, across all of Germany, and to the Netherlands in the west, encompassing the Baltic nations and most of France. 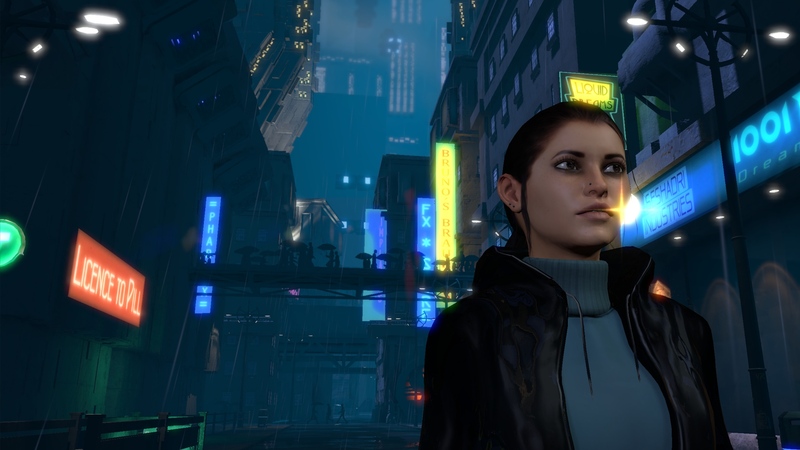 In Dreamfall Chapters, Zoë will spend quite a bit of time exploring this urban landscape. We have several ‘pockets’ of free-roaming adventure gameplay, and Europolis is one of them — Marcuria, in the magical world of Arcadia, is another. Players can explore, experience the environment, story and characters in a non-linear fashion, and decide their own pace before they push the main story forward. RPS: If I think cyberpunk, I tend to look toward America or Japan, which may betray my own cultural bias, but you’re dropping the noir-bomb right in the heart of Europe. 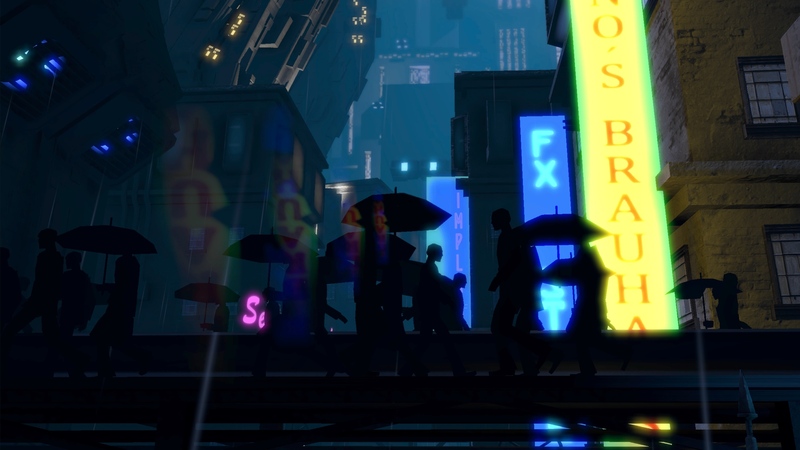 The sprawling city-state makes me think Bladerunner, as does the imagery of the video, particularly the umbrellas oddly enough, Why Europe and can you name any other inspirations? Tørnquist: We’re European, and Europe is often, as you say, under-represented in games — particularly in this fashion. It’s also a location we’ve spoken about in previous games but have never visited, and we felt it was time — it really is one of the most intriguing locations in The Longest Journey saga. Blade Runner is, of course, an inspiration, but we also wanted to get away from the cliché of the North American megacity with strong Japanese influences, and base it on something a bit closer to home. Our Europolis is a mix of Germany, Poland, the Czech Republic and France — a lot of interesting cultural and architectural influences — set two hundred years into the future. Berlin, in particular, has been a source of inspiration, and I think it’s a city that lives and breathes techno-noir. Which is totally Europolis. RPS: It was clear from the first world-spanning moment in The Longest Journey that there was an interest in showing the contrast between worlds – that has always seemed to be linked to a fascination with the diversity of human life, imagination and condition. Could you talk a little about any real world locations that have inspired scenes or settings? Tørnquist: The contrast between the two worlds — Stark and Arcadia; science and magic; order and chaos — is key to our universe, and it’s something we always want to do more of. Really emphasise the huge difference between these two settings. I mentioned Berlin as an influence for Europolis…mixed with a bit of Blade Runner and Mega-City One, of course. New York’s East Village was a huge inspiration for the neighbourhood of Venice, in Newport, the North American city in The Longest Journey and Dreamfall. 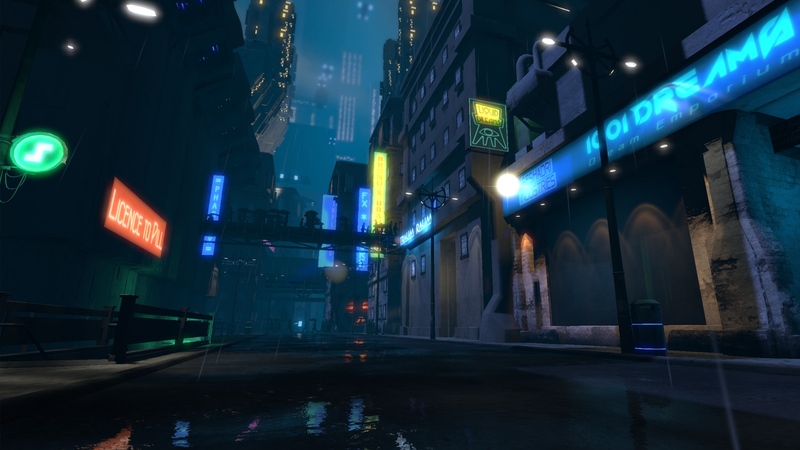 For Casablanca, in Dreamfall, we wanted to create a warm, cosy, affluent version of Africa. As for Marcuria, there are no real world parallels, but we’re all fans of imaginary cities, and Marcuria borrows from a host of sources — including the fantasy classics. RPS: A collapsed Europe isn’t entirely unimaginable – we’ve spoken before about artistic, personal and cultural influences, but how strong is any intentional political element to your work? Tørnquist: There is always an intentional political element to our work! But I’m not sure it’s something we want to overtly state. A lot of it will depend on the player’s own point of view and interpretations. Of course, with Europolis, we’re basically saying “Europe is going to degenerate into poverty, crime and chaos” — maybe overstating things a tiny bit, but hey, that makes it more interesting! There’s more to it than that, of course, and there’s a lot of stuff under the surface. You’ll find out more through the characters you meet, the dialogues, the puzzles, the story. 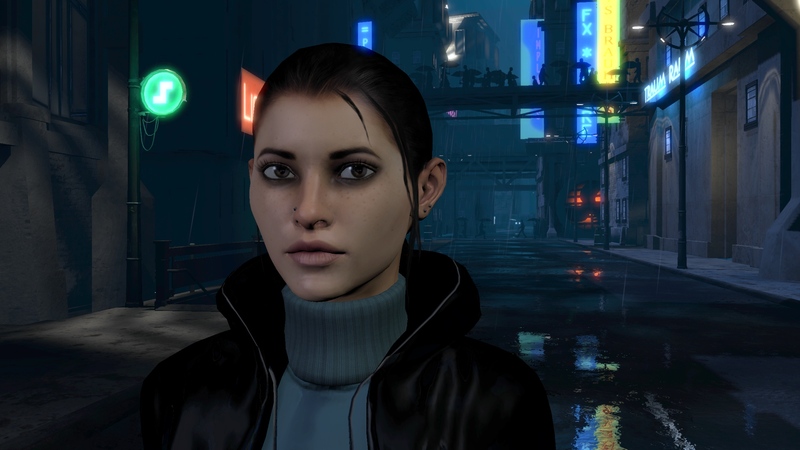 But yeah, there’s definitely a political element to Dreamfall Chapters, as there was to Dreamfall as well. RPS: What is the process for creating the initial drafts of a new ‘world’? Do the writing team storyboard or do the art team translate ideas and words into images? Tørnquist: We write the words, give the precious words to the artists, who then create magic. It’s often as simple as that. With Europolis, it was something we needed for the story, but also something our art director jumped on immediately. I think all artists jump at the chance of making proper, old school cyberpunk. It’s in their blood. Usually, it’s a collaboration. We need certain locations for the story and the characters, but we’re also quite flexible, and we want the artists to brainstorm, to show us what they can do with the engine and the tech, to be inspired — and to inspire us in return. It’s a back and forth process. With Chapters, we’ve actually modified the story a bit and added scenes based on some amazing stuff the artists have shown us. Gaming is a collaborative medium, and you really do need to be flexible and allow for outside ideas to challenge and add to your vision. Usually, that’s a very, very good thing. RPS: Is Mira playable? Is Wit playable? Who is playable?! Tørnquist: No. No. Who’s to say? It’s all a blur, to be honest. We’ll have more on this soon, I promise. There will be three playable characters in Chapters. And two of them are NOT Zoë. RPS: Wit is a ‘silent genius’ – saving on voice actors’ fees, eh? What has happened to his eyes? Is that the new iPhone stuck in the sockets? Tørnquist: He’s the iWit, manufactured by Apple. Actually, he looks more like a Samsung guy, to be honest. RPS: With seedy nightclubs, cyborg gangs, live research subjects for genetic testing and all manner of poverty and exploitation, will there be graphic content? Europolis is a dark place, and Mira and Wit sound like they probably deal with some unpleasant situations and characters. How much of that unpleasantness will be implied and how much will be shown? There will be unpleasantness both implied and shown — although we’re not going to drown the player in sleaze and filth. Chapters is a game of contrasts. Of light and dark. And for every Mira in Europolis, there’s a Blind Bob in Marcuria. For every Wit, there’s a Crow. And for every inner-city wasteland there’s a beautiful, sunny, magical landscape.